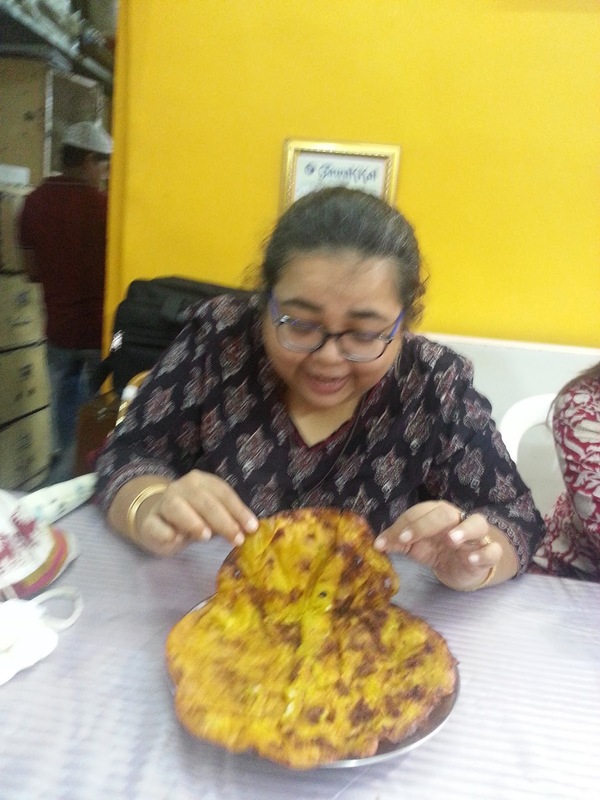 euphoRHEA: During Ramzaan it had to be Bohri Mohalla! I've looked forward to the holy month of Ramzaan every year with great eagerness - my devout Muslim friends would be ashamed of me as my motivation has been the fabulous food that's served in the evenings in the Muslim localities in the city, especially at Bohri Mohalla. I will defend myself saying my devotion is to the food, regardless of the occasion. The month of Ramzaan, for Muslims, is not just about fasting - it's about reflection, about understanding deprivation and gaining an understanding of the lives of those less fortunate, and is about learning discipline and self control. Growing up, I saw many of my Muslim neighbours and friends observe the rozas - and looked forward to being invited for Iftar in the evenings. It was beautiful! The family would gather, prayers would be said, and then the table would groan with varieties of delicious food so different from what we ate in our house. I was lucky to be included. After I got married and moved to VT, I discovered Mohammad Ali road, and the lanes and by lanes of the various mohallas in the area thanks to the hubby. One day a close friend, Imtiaz, introduced us to Valibhai Payawala in Bohri Mohalla. It was love at first bite for me, rats and other creatures not withstanding. I also discovered the wonders of the huge tava at India Hotel in the parallel lane. How often the hubby would pick up some rolls and a couple of portions of bhuna on the way back from work, for me to feast on at home! Plates of beef bhuna at India Hotel. They also serve chicken and mutton here. Aloo Bhuna. Unbelievably delicious! Also at India Hotel. Then there was Tawakkal sweets just next door where, during Ramzaan, you got the most heavenly malpuas. That malpua is mine! All mine! At Tawakkal Sweets where you will also get top notch malai khajas, phirnee, and other sweet goodies like fruit infused barfis. It became a yearly thing to do - we would go as often as we could in the evenings through the month of Ramzaan, though we did go the rest of the year too. Then we moved to Kharghar. We didn't go as often and soon it became a Ramzaan ritual. I guess the bright lights, the carnival atmosphere, the aura of something out of the ordinary, and the fact that stalls remained open till late in the night all added to the magic and we were unable to resist. We went as often as we could, and we took along anyone who was interested, undaunted by the sometimes less than hygienic conditions, the crowds, and the fact that there was a lot of beef on the menus. 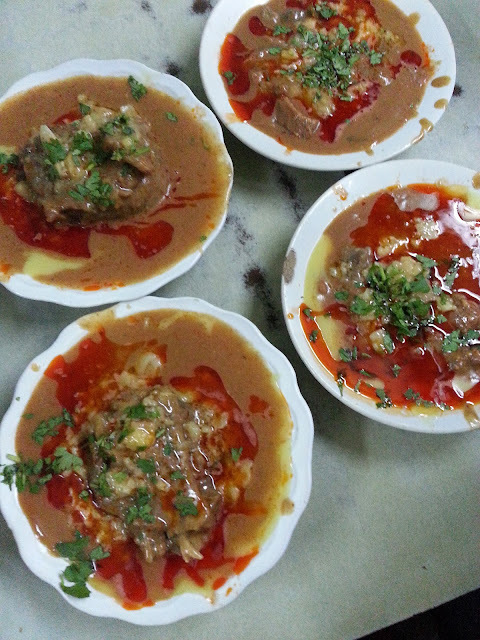 If visiting friends asked for an out of the ordinary experience in Mumbai Bohri Mohalla is where we took them. We've never had anyone come back disappointed. Barbecue on the opposite side of the road served what we call 'spare parts' - gurda, kapura, tilli, kaleji. Most of the stuff ran out pretty soon so the earlier you got there the better were your chances. 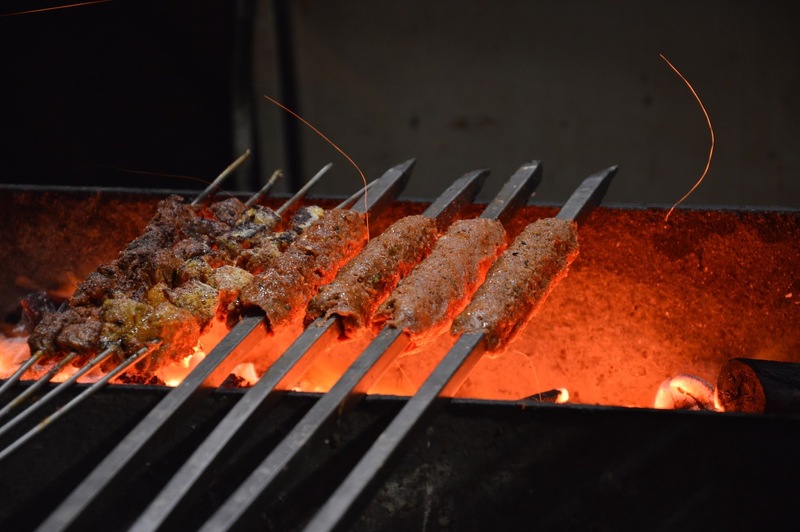 This shop also does a variety of seekh kebabs, coal grilled chicken legs and all sorts of other delightful finger foods. You just stand around the shop and gobble down the goodies hot off the grill. Cross the road and you're at Taj Ice creams. 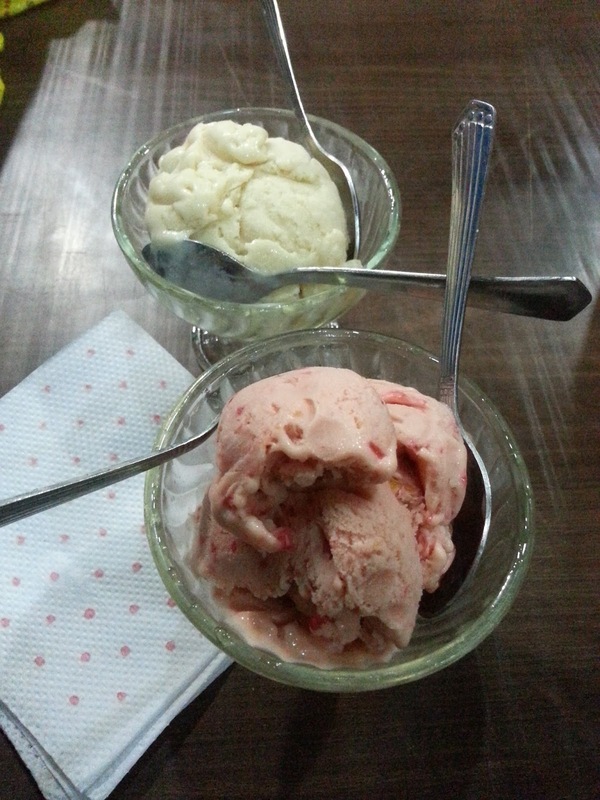 This shop has been making hand churned ice creams for the last 129 years. And is still going strong with a fanatically devoted clientele. Fresh fruit ice creams, hand made using seasonal fruits, milk and cream, served in little glass ice cream cups. The lanes have many treasures and if you walk further into the Mohalla you will discover Noor Sweets. 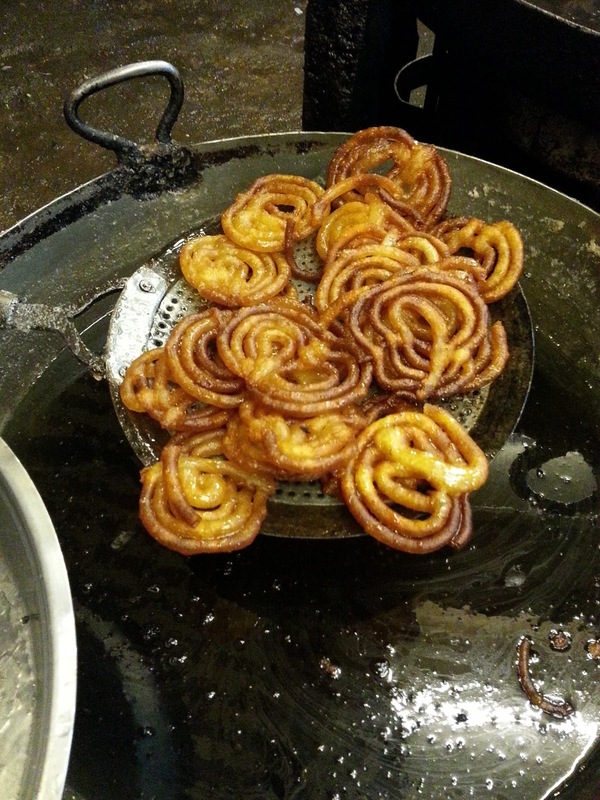 Ask for their hot jalebis, straight out of the kadai, dipped for a moment in sugar syrup and then served hot. I promise you you won't be able to eat just one or two! 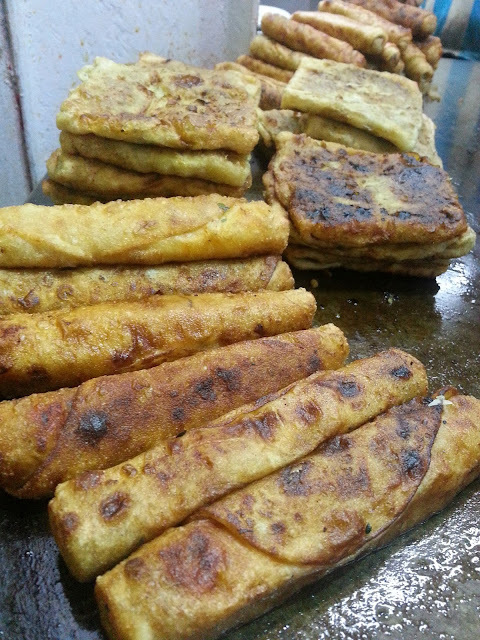 Noor Sweets has a fabulous menu packed with all manner of sweet goodies including malpuas and khajas. They have a chocolate malpua too so if you're feeling adventurous, try it out! Jalebis in the making. 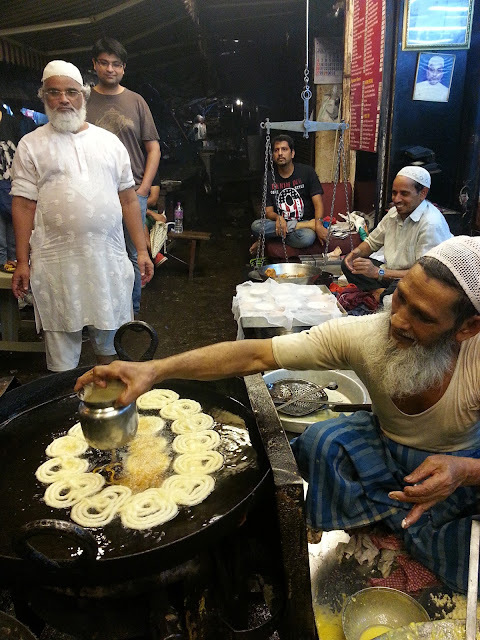 This gent churned out hot jalebis and malpuas tirelessly. You will find fruit sellers, shops selling masalas and spice mixes, farsaans, groceries, sharbat, and other assorted foods scattered around the mohalla. While we lived at VT, and later when we moved to Kharghar we used to go to Vallibhai's shop so often that if the hubby went without me, the owner, Vallibhai's son, would ask after me - Baby nahi ayi? I think he was saying bhabi, but the hubby insists he said 'baby'! Good honest food builds relationships and we had built one with this place. The staff would greet us eagerly every time we went. 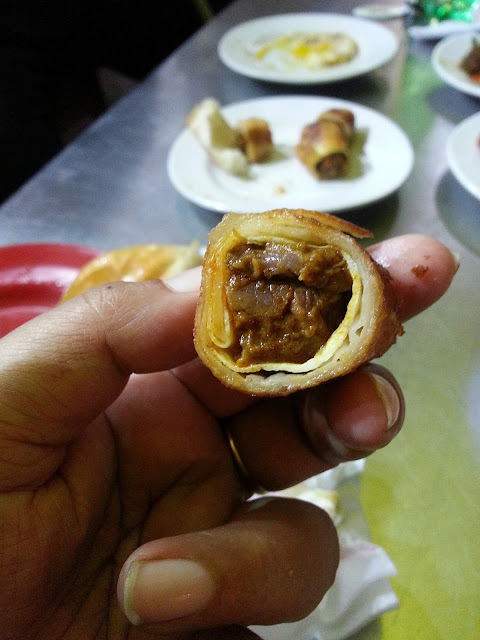 The owner would always come by to our table, chat with us, ask what we particularly liked on that day, discussed the food business, market trends, etc., with the hubby, and he always slipped me an extra loaded helping of nalli. Topa, Pichhota, and Nalli Nihari at Valibhai's. Different cuts of meat served in a combination of gravies, tarri, and nalli. This, in the photo above, is what is well known as baara handi (12 pots) where cuts of meat and different gravies and stocks are slow cooked in a total of 12 different pots. 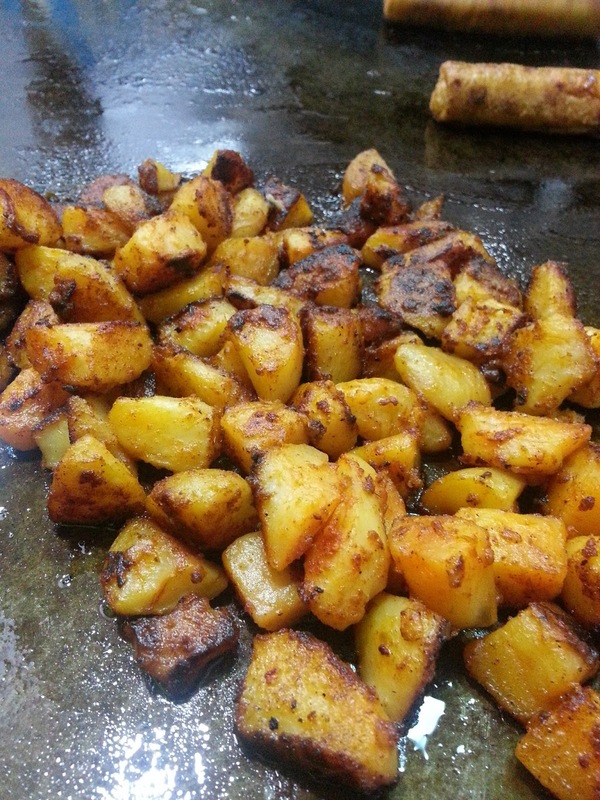 Dishes are mainly identified by the cut of meat and have a combination or all of the gravies and stocks. Each dish is finished with a splash of tarri, fat skimmed off the pots and collected in a separate vessel. Last year we did five trips to this wonderland of food. I think deep down I knew things were going to end. And I was right. Beef was banned in Maharashtra. And ValliBhai Payawala shut shop. I don't know which is worse. Bohri Mohalla and its delights are still there but now it's a severely edited version. 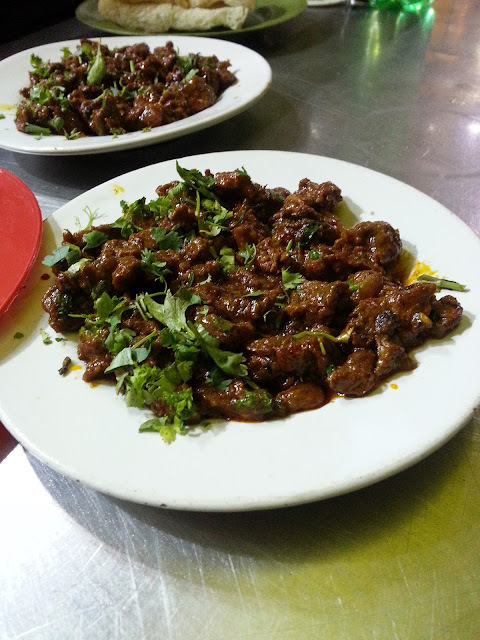 Without beef and without the baara handi at Valibhai's, for me it's going to be quite lacking in flavour. 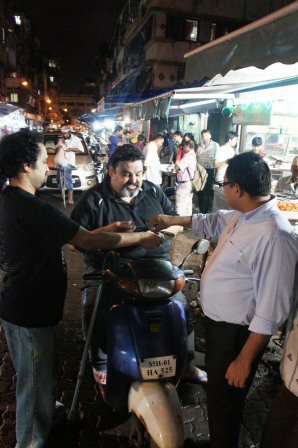 My friend Kalyan writes his farewell to Valibhai's here and I am with him when he says " A delicious bit of Mumbai history came to an end". This is the moment where I look helplessly sad. 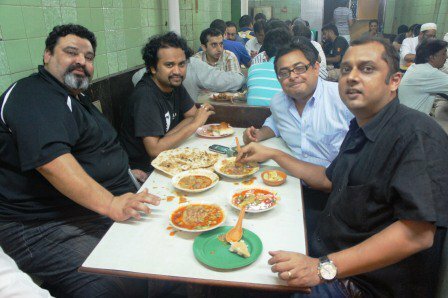 I have had the nalli nihari and the baida paratha in those places. Waaaaaaaaaaaaaaaaaaaaaaaaaaaaaaaaaaaaaaaaaaaaaaaaaaaaah! I owe Imtiaz for taking us to Vali's and my grandfather for taking me to Taj Icecream 40yrs ago ... taking others there was simply 'carrying it forward' ... I am so glad to read this glad that I could share this with so many people who love food and sad that I wont be able to share Vali's anymore. This beef ban will make things very different but the redevelopment will mean that in the next few years the flavour that is Bohri Mohalla will be changed forever.